I believe one of the biggest reasons people get discouraged with goals and resolutions is due to unrealistic expectations about time. If you have unrealistic expectations about how much you can accomplish in set amount of time, it’s a surefire recipe for discouragement and frustration. What’s worse, if you don’t recognize that the true issue is unrealistic expectations about time, you may begin to apply negative labels to yourself such as I’m lazy or I never achieve my goals. And that feels awful. It’s no wonder we all want to throw in the towel on our resolutions in less than a week’s time! So what’s the solution? Becoming intentional about time. The key to getting anything done is effective time management. In other words, you invest your time in projects and tasks that matter, those that enable you to live your intention. But, it’s essential that your time management plan is also realistic, rooted in an understanding about what is possible to get done in the time available. If this sounds like the solution to your getting-things-done dilemmas, here’s a five step process to help you get started. Step 1: Know your intentions. The first step is to become clear about your intentions for your time. What do you want to do? What activities fill your life with purpose and meaning? What do you need to do? We all have must-do tasks like laundry and grocery shopping that have to be taken into consideration. So start by creating a list of how you want and need to spend your time. Step 2: Organize and Prioritize. Once you have a feel for how you want and need to spend your time, it’s time to get organized by dividing your list into recurring tasks and one-time projects. In my last blog post, A Fresh Approach to New Year’s Resolutions, I shared my 2018 intention is to feel good and be happy so I can help others live a better life. This intention led me to create three buckets of tasks and projects, centered around physical health, mental health and connection with others. I organized my list by category (physical health, mental health and connection with others) and then identified each task as a daily practice, weekly task or one-time project. Intention: Be intentional about what I put into my body and notice how things make me feel. Meal Planning that focuses on healthy, low-cal meals, more fruits and veggies, healthier lunches, healthy snacks for work, and eating more dinners at home. Grocery shopping. Of course, a meal plan is useless if we don’t go to the store. Cook healthy meals for dinner. Intention: Become intentional about getting good sleep by creating and following a night-time routine. So far my nighttime routine consists of the three mental health practices outlined below. Within connection with others, my overall intention is to nurture my relationships with others. 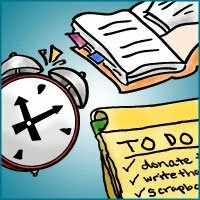 This is a bit less task focused, however, from a time management perspective, it’s important to earmark time for others. For example, I’ve carved out Friday nights to spend time with Jay and / or friends and Sunday nights are for family dinners. Your buckets and tasks may look completely different than mine, and that’s fine. The main goal is to organize your tasks and projects by what you want / need to do on a daily basis, weekly basis and less frequently such as on a one-time basis. As you’re organizing your tasks, think about what’s most important to you. Prioritizing your tasks and projects will help you make decisions when you run into time conflicts and have two different activities vying for the same slice of time. Once you have your tasks categorized, identify your available time slots and assign tasks to them. Here’s how. Remember that whole thing about being realistic with how much you can get done? Well that starts by identifying how much time you have available. If you work full time out of the home, for example, your available time is likely evenings after work and weekends (plus any paid time off). If you’re a work-at-home mom with young kids, then there are huge chunks of time that aren’t yours. They’re spent taking care of your kiddos, whether that’s feeding them, getting them dressed, playing, driving them to activities, etc. With those thoughts in mind, identify as best as possible the time that you have available for your tasks and projects. Maybe it’s naptime or after the little ones are in bed. Once you know your available time, start assigning the priority tasks and projects to chunks of time. Here’s an example. So as to not be redundant and bore you to tears, everyday my plan includes three mental health practices: gratitude journaling, meditation, and journaling plus making a healthy dinner. Here’s how the rest of it shakes out. So try on your plan with a mindset of curiosity. Which pieces of the plan will work? Which things will need to be shifted around? What did I forget to include in my plan? And then, move on to step 5. As you see what’s working and what’s not working, tweak your plan. You may find that you have less control over your weeknights than you anticipated when you made your plan, so you might find it productive to shift some tasks to the weekends. You may find that you have less mental energy on weeknights than you realized so you might decide to move tasks like house cleaning or laundry to the weeknights, and move tasks that require mental energy like paperwork or financial tasks to the weekend. Keep tweaking things until you find a plan that works for you and allows you to be intentional about your time. Alright – that was a long post! Let me know what questions you have. Aby, it’s so good to have you back at blogging! Thanks for this post–it was both inspiring and helpful. I love how you provided the examples. I couldn’t agree more about the need to be intentional about spending time, since I’ve definitely experienced the difference it can make. And–ahem!–it’s definitely time for me to be more intentional, so this is great inspiration. Looking forward to reading more about this! Nancy! It’s so nice to hear from you. Glad the post was helpful and inspiring. So true – things do always take longer in the real world than in our heads! Great idea to use a planner to get your brain on paper. It’s good to separate the projects that cost money and are free. Not only that does get you more organized, but it’s a little budget for your home projects as well.